Welcome to the Gigajam Guitar School. Get ready to learn to play guitar with our award-winning web-based method. 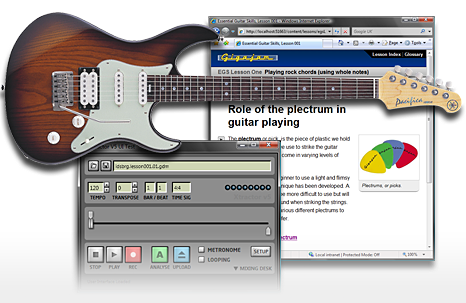 An introduction to the guitar and how to use Gigajam's lessons and software. If you are new to Gigajam or to the guitar, start here. Understand the layout of the guitar and how to follow chord boxes. You will be able to play a couple of rock chords with music by the end of this lesson. Learn how to create rhythm using different notes. Play a series of rhythms with your rock chords along with music. You will be developing a good understanding of rhythm and how to read rhythm on the musical stave. You will also learn two new chords to mix with your existing chords. Sound like a real rock guitarist using all the rhythms and chords learned so far. You will be acquiring the techniques that make you sound like a professional. The world of rock chords is wide open for you now, as you are taught how to learn and be able to play every power rock chord there is! With rock chords in the bag, it is now time to use all your skills to develop playing all the chords you need. This lesson starts you on the journey introducing strumming technique and major and minor chords. This lesson provides a more in depth look into strumming technique and opens up another world of rhythmic playing for you, whilst learning even more chords for your library. More chords, developing your rhythm and ability to move fluently around the guitar neck. Learn how to play with a professional band, whilst reading a guitar chart. This lesson focuses on reading and navigating a musical score. When you've finished this lesson you'll be performing at grade three standard. This lesson introduces sixteenth notes and goes on to develop your rhythmic strumming skills by developing up and down strokes and simple combinations of sixteenth and eighth notes in common rhythms. This lesson completes the library of open chords you need to know before we move onto barre chords in depth in Lessons 13 and 14. You will learn the chords of E7, Em, A7 and Am7. This lesson begins to open up a world of chords for you by introducing the concept of barre chords. This lesson will focus on creating barre chords rooted from the 6th string. By the end of this lesson you will be able to play E, F, Fm, Fm7, F#, F#m, A, Am, Ab, Am7, A7, G, Gm, G7, G#m, Bb, Bm7, B and C.
Developing the concept of the creation of barre chords this lesson develops your ability to play barre chords rooted from the 5th string. This lesson starts the study of sound and silence, introducing rests, their symbols and the affect they have on the development, construction and playing of rhythm. This is the second lesson in Level 2 that is devoted to reading and the understanding of rhythm. By the end of this lesson you will be able to read, recognise and play both dotted notes and ties, giving you access to sophisticated rhythmic patterns. We are laying the groundwork for guitar solo studies that follow in Level 3. Here you will develop your ability to hear, recognise and play a 1-4-5 chord progression. This is the third lesson in this section devoted predominantly to the understanding of rhythm. Triplet based rhythms are commonly used and need to be understood in order for the modern guitarist to be able to play in a variety of rhythmic and musical styles. This lesson points the way to your Level 3 studies and introduces the concept of the minor pentatonic scale, so that you have a basis from which to begin playing guitar solos. To accompany scale knowledge, we also introduce a number of lead guitar techniques so that you will be able to play some guitar solo ‘licks’ by the end of this lesson. Continue to learn how to play with a professional band, whilst reading a guitar chart. This lesson focuses on reading and navigating a musical score. When you've finished this lesson you'll be performing at grade four standard. Part three of the course is devoted to the development of learning to play lead guitar using the techniques learned at the end of part 2, along with some new techniques and some licks. In this lesson we introduce the skills of Hammering on and pulling off and integrate these into some useful licks. In this lesson we will start by building our musical theory and show how this relates to our ability to play lead guitar. We will develop the skill of playing the extended A minor pentatonic scale and learn to play licks all around the extended pattern. We will develop the understanding of identifying the root note, as this will become very useful as we progress. We develop the theme here by learning pattern 3 of the minor pentatonic and incorporating the blues note. We will develop improvising within the scale by studying and learning some new licks. We develop the theme here by learning pattern 4 of the minor pentatonic and incorporating the blues note. We will develop improvising within the scale by studying and learning some new licks. We will also connect patterns 3 and 4 together using the root note. This is the third lead guitar lesson that builds upon your existing knowledge and develops your knowledge further, this time by learning pattern 5 of the minor pentatonic. We also include the blues note. Improvisation is developed with the scale by studying and learning some new licks. We also connect patterns 1 and 4. We now introduce and develop our understanding of the minor pentatonic pattern 2. Having done so, we can now integrate all the patterns learned so far. We take this a step further by developing the ability to solo in a number of different keys. In this lesson we introduce the concept of landing notes and safety notes when soloing. As a contrast, we also develop our musical understanding of licks that don’t land on root notes and we take the whole lead guitar playing one step further by looking at genuine improvisation. The focus has been largely on the development of simple rhythms through our lead guitar studies thus far. This lesson specifically incorporates triplets to develop the rhythmic content of our solo playing. As we have done before we will apply triplets to Blues and the extended scale. Continue to learn how to play with a professional band, whilst reading a guitar chart. This lesson focuses on reading and navigating a musical score. When you've finished this lesson you'll be performing at grade five standard.